Day two of competition is in the books and SunStang is ahead of schedule and doing well! Despite not expecting to go through scrutineering until tomorrow the team was able to attend 6 of the 10 stations this afternoon. As a result, we are halfway towards dynamic testing; the most difficult and final part of getting on the track. The team watched on as the solar array was tested, providing us with valuable data and IV curves for our panels. The vehicle's mechanical and electrical systems were also inspected and nothing out of the ordinary was found. Finally, the driver's were registered and the car's visibility was examined. Much to the team's excitement, no major issues were found and only a few minor fixed are needed. 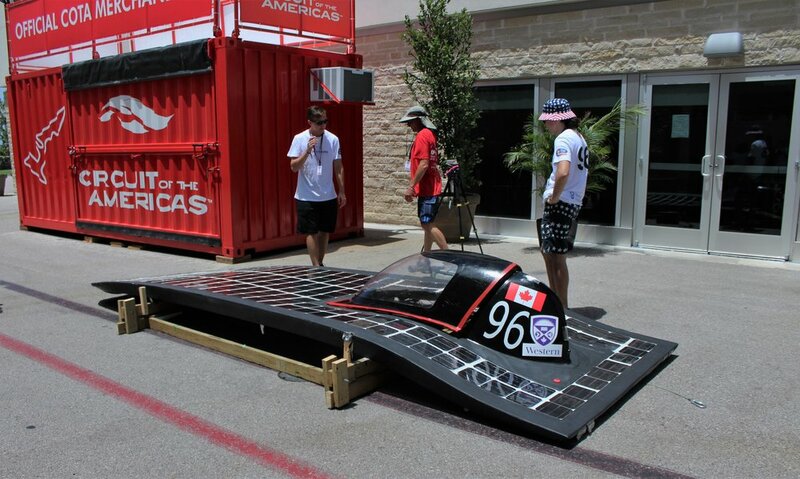 The one speed bump encountered was with the team's battery protection system. However, after a couple of hours of troubleshooting the bugs have been stamped out and it should pass scrutineering with flying colours tomorrow. The team's hard work was rewarded at the end of the day with Fourth of July fireworks as we wrapped up work for the night. Despite the persistent hot weather the team is still in good spirits and enjoying their time in Austin. It was beyond gratifying to start to see the years hard work result in success as FSGP and we hope that success continues tomorrow and into the race days later this week.